Tales from a tribble: Have An Easy Fast On This Yom Kippur! Have An Easy Fast On This Yom Kippur! On this Tuesday, September 18, 2018, at sundown, begins the Jewish Holiday Yom Kippur. This is the Highest Holy Day on the Jewish calendar. It marks the culmination of the ten "Days of Awe" from Rosh Hashanah [the Jewish New year] to Yom Kippur [the Day of Atonement]. The 10 Days of Awe [days of repentance] are considered the High Holy Days for the Jewish people. This is a time for serious introspection, a time to consider the sins of the previous year and repent before Yom Kippur. "Although Yom Kippur is an intense, solemn holiday, it is nevertheless viewed as a happy day, since if one has properly observed this holiday, by the end of Yom Kippur they will have made lasting peace with others and with God." Yom Kippur is a day of reconciliation, when Jews strive to make amends with people and to draw closer to God through prayer and fasting." Yom Kippur is marked by 25 hours of fasting. There are other fast days in the Jewish calendar, but this is the only one the Torah specifically commands us to observe. Leviticus 23:27 describes it as "afflicting your souls," and during this time no food or liquid may be consumed. The fast starts an hour before Yom Kippur begins and ends after nightfall on the day of Yom Kippur." According to Jewish tradition, it is also the day when God decides the fate of each human being. 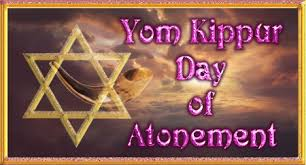 The evening service [on September 18] of Yom Kippur is often referred to as the Kol Nidre ("All Vows") service: "These are the first words of a special legal formula that is recited at the beginning of this service and is chanted three times. The first prayer service actually takes place immediately prior to sunset on the evening of Yom Kippur." It has become traditional for the Kol Nidrei vows to be recited with the accompaniment of the classical music composer Max Bruch's solemn "Kol Nidre" music. The service on the day of Yom Kippur [Wednesday, September 19, 2018] lasts from morning until nightfall. Shana Tovah said on Rosh Hashanah and Yom Kippur and throughout the ten Days of Awe means simply 'a good year' in Hebrew. It is a wish for you to have a good new year. 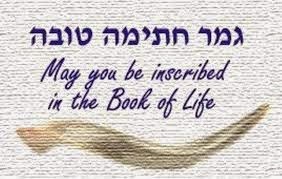 On the 10th day just before Yom Kippur the phrase Gmar Chatima Tova is said which means "A good final sealing" or "May you be inscribed [in the book of life] for good". It is generally said to also mean "may you have a healthy, peaceful and fulfilling year". Please enjoy this beautiful rendition of the recitation of the Kol Nidrei, as sung by the great Johnny Mathis. 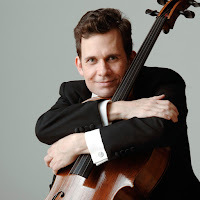 At the synagogue I attend, not only is the Kol Nidre beautifully performed before the service by the cantor accompanied by a string quartet, near the end of the service they have the cello version of Kol Nidre played by the virtuoso principal cellist of the Houston Symphony Orchestra, Brinton Averil Smith. To hear how beautiful the cello sounds playing the Kol Nidre, here is a version for cello and piano. To all Jews I wish an easy fast on this Yom Kippur. I agree Brad... And done with so much feeling- not faked. Beautiful! THanks for posting. Since I worked late tonight, and missed going to synagogue, this was my Kol Nidre for tonight. It made me at least feel like I heard this very important prayer that we all should hear or say every year. Wow! Thanks Stephen and Leslie-that was so nice of you to say - and I felt the same way! God Bless! Thank you for this very special Kol Nidre message. Just came home from services and read this post and listened to the music. Beautiful! I want to share this with my friend and her granddaughter. The granddaughter is writing a paper for her college religion class. They are Catholic. I suggested they visit a temple for the Kol Nidre Service. Blessings to you and Sherilyn for a healthy and peaceful year! Thanks Aunt Carla so much. Same to you and the whole Saint Louis family!! Love, Michael and Sheralyn. Wonderful to sit with you last night at Kol Nidre at Temple Emanu El last night. Very special!! And it was a blessing to sit by you and Leslie big Stephen!